A photograph that I would entitle "The wave". 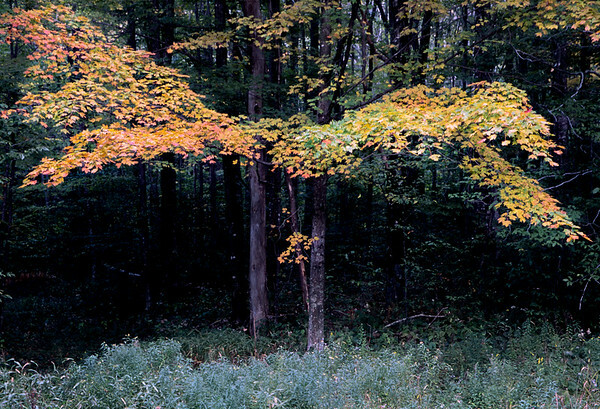 It was taken on Spruce Knob in West Virginia in 2001 (on a slide film). We have been driving on an endless winding gravel road and it was already getting dark, but I was so attracted by the yellow foliage wave that we had to stop. There was just a Twitter post or rather Twitter question by National Geographic about the first camera that one used and what one photographed. This reminded me of the photograph below, which is one of my first "serious" photographs that I remember. It was taken in 1987 (I was a teenager at that time) with my first SLR, which I had bought with my savings (it was a Konica Autoreflex TC). 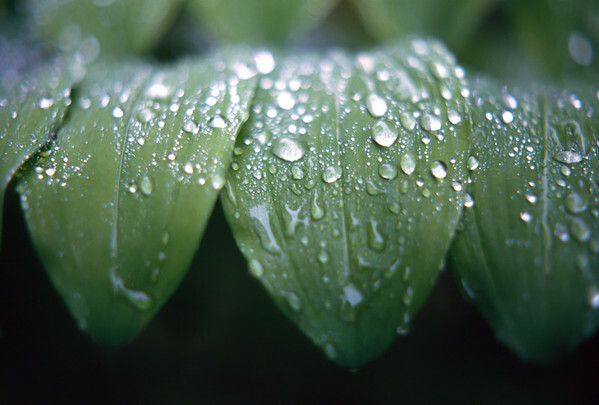 The leaves are those of the King Solomon's Seal (belongs to the genus is Polygonatum) and the raindrops are real (even though I took the photograph 24 years ago, I still remember that it was raining). If somebody had told me on that day that I would post this photograph in a digital form in the internet in 24 years, I would of course neither have known what a digital photograph nor what the internet is. Amazing how things change! Fall is not only the season of spectacular fall colors, but also the blooming season of Dahlias. The wild form of Dahlias is a native to Central America, Colombia and Mexico, but these plants are most famous for the thousands of cultivars that have been bread since 1813. For the scientifically inclined among you, I may mention that Dahlias have eight sets of chromosomes (they are so called "octoploid", humans for example have only two sets of chromosomes and are therefore diploid), which is the main reason for their enormous variability. At this time of the year, over 270 varieties of Dahlias can be admired blooming on the island Mainau, in the Lake of Constance. If you are in that region in the next couple of weeks, I highly recommend a visit! Steve McCurry is a highly respected, successful and acclaimed documentary photographer, but nevertheless only few people probably know him, his work or his books. Steve McCurry has been awarded the 2011 Leica Hall of Fame award, on the occasion of which Leica prepared this wonderful retrospective. The single most famous photograph of Steve McCurry is his portrait of the "Afghan girl" Sharbat Gula, which has become the most recognized cover photograph of National Geographic ever. I remember well the touching article entitled "A life revealed" in National Geographic of April 2002. After the portrait was published, Steve McCurry tried to find Sharbat Gula again, but only in 2002 a team from National Geographic could finally locate her. Sharbat Gula had only been photographed in 1984 by Steve McCurry and then again twice in 2002 for the determination of her identity and she had not seen her famous portrait until 2003. In appreciation of Sharbat Gula, National Geographic created the charitable Afghan Children's Fund. A photograph I took many years ago (in the pre-digital era) while camping on the Lofoten Islands in Norway. The photograph evokes memories of an afternoon and evening hike, blueberries for dessert, a beautiful sunset and this sunrise just a few hours later. I like the thin layer of mist and the cloud over the sea as well as the sunbeams breaking through the clouds above. More of my landscape photographs can be found here. I remember the day ten years ago very well. As every morning at that time, we were riding our bike to work. In Maryland, September 11 2001 started as a beautiful, sunny, early fall day. The air was fresh and the sky was bright blue and cloudless. A few leaves timidly started to change their color. A deceiving tranquility and peacefulness as we should soon find out. Only a few hours later, the sleek towers of the World Trade Center in New York, that just rose up to a height of 417 and 415 meters, tore a glaring hole into lower Manhattan and into many people's lives. The north tower of the World Trade Center was finished in 1972 and became the world's tallest building, towering 417 meters over Manhattan (until Chicago's Sears Tower overcame the two Twin Towers in May 1973). The World Trade Center was the workplace for as much as 50'000 people and each day 200'000 visitors were attracted to the twin towers. Over the years, the correspondent of a third of the world population may therefore have passed through the World Trade Center as a visitors. The World Trade Center skyscrapers certainly left an awe-inspiring impression and good memories in the lives of many of these visitors. Through the dreadful events of 10 years ago, the good memories of the World Trade Center became tainted and connected to an act of incomprehensible violence and destructive power that is considered by many as a decisive turning point in most recent history that still affects us today. Having visited New York and the World Trade Center shortly before its destruction and having lived just outside of Washington made me experience the shock and aftermath of the attacks on the World Trade Center and the Pentagon very close. Whenever I think of that day, the images of that beautiful morning directly relay to the horrific news that followed and mix with sympathy and empathy for the people that mourn and suffer even to that day. It has created a special bond and connection that is difficult to explain. 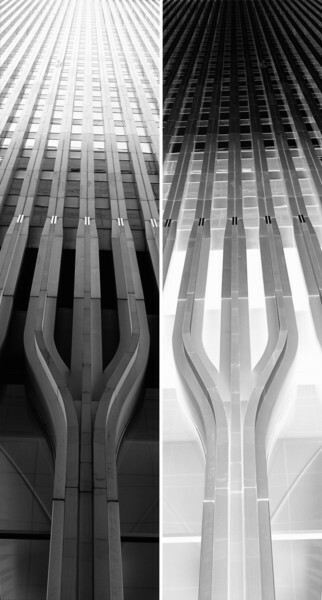 At least to me, the World Trade Center has become a symbol for the positive and the negative, which is why I had the idea to combine a positive and a negative of the World Trade Center in one composite, diptyque image. A few weeks ago, an evening rain and the setting sun created this remarkable rainbow. I had just enough time to climb an observation tower that is close to where we live. Annoyingly, the observation platform is covered by a wire mesh that complicates photography (but creates photogenic shadows at other times); especially since I had to take six frames in order to capture the rainbow in all its glory from beginning to end (but I still missed a part of the secondary rainbow at the top). 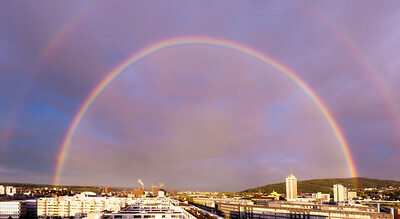 The rainbow was so close and immense that it was necessary to move around the observation deck, which is probably the reason for the slightly bumpy photo-stitch (at least I did not forget to remove the polarizer in the heat of the moment). Nevertheless, I have never seen a complete rainbow before and I am glad that I managed to capture it. Those of you who can appreciate both the miraculous beauty and the scientific explanation of the rainbow may want to look at the wikipedia entry for "rainbow" or even read Richard Dawkins' "Unweaving the rainbow" for more examples of scientific discoveries that even raise the beauty of nature. One Sijo per day as an outdoor art and design installation? This is Jiyeon Song's "One day poem pavilion" in Mito City in Japan. One day poem pavilion is a canopy consisting of perforated boards that are designed to project Sijo verses onto the ground. Throughout the day the moving sun projects five verses of two different poems - one projected during the winter and the other during the summer solistice. I really like how Jiyeon Song's light and shadow art and design is integrated into its environment. The architects Fabio Gramazio and Matthias Kohler, who both teach and research at ETH Zurich, go even a step further. In an approach called "digital materiality" walls and surfaces are robot-built according to computer-calculated specifications that create deliberate patterns of lights and shadows on the outside and inside of buildings. 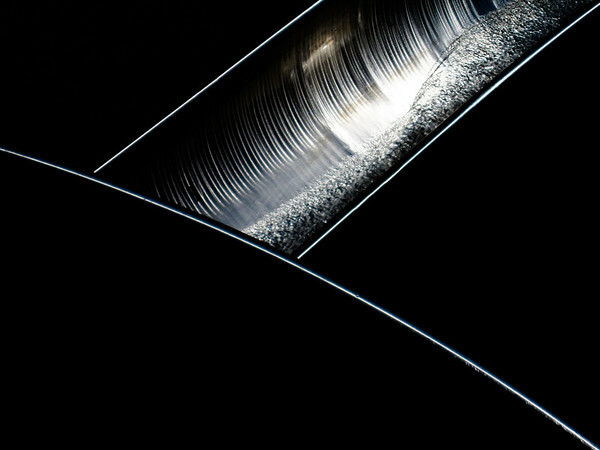 I am looking forward to many future buildings that incorporate lights and shadows on their surfaces and inside as design elements. Light and shadow always come together, but never are together. Constantly chasing each other, never catching one another. I really love how shadows change during the day and throughout the year and how they transform the ordinary. I do not think that shadows are only an incomplete projection of the real world but rather a part of reality. Becoming conscious of the shadows and lights that paint your environment is the start for discoveries that can amuse and please and that may give you tiny bits of happiness on every day.